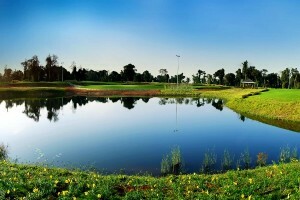 Long Vien Golf Club is the first 27-hole course in Laos. The original 18 opened in 2012 and the second 18 in 2016. 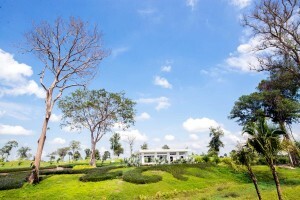 The Laos golf course is located in a special duty free zone 16 kilometers outside Vientiane and 1 kilometer from the Mekong River which separates Thailand and Laos. The Vientiane Golf Course is laid out on basically flat topography. Manmade mounding, water features, intricate sharp-lipped bunker complexes provide the main challenges. Wide fairways are framed by mature trees, flowering plants and red-grass water areas. The all Paspalum grassed course ensures good playing conditions year round. At 7,538 yards from back tees Long Vien plays a plays very long par-72. The East Course plays through a series of lakes and forested areas. Greens are protected by water hazards and club selection is important when hitting approach shots. The West Course is more open but has more bunkers and undulated fairways. Facilities at Long Vien include chipping and putting greens and grass driving range. The clubhouse is modern with posh locker rooms, international restaurant, and well-stocked pro shop. Long Vien Gold Club is floodlight for night golf. Caddies are all male and while their English is rather limited their golf knowledge is quite good. Overall a very impressive crew with high service standards.